O Netflix! Social Movies Come to Facebook, But Not in U.S.
Netflix has good ideas, mediocre PR, awful naming instincts, and terrible timing. Timing so unfortunate lately that one begins to fear CEO Reed Hastings was cursed by a powerful witch under a blood oath sworn to unmerciful gods. Hastings appeared on stage at Facebook’s F8 developer conference to announce a new, intriguing, and potentially lucrative partnership with Facebook. The alliance enables eligible members to easily share what they’re watching on Netflix with their family, friends, and associates on Facebook, whether on Netflix’s site or on Facebook’s. Sounds promising! What’s the downside? Unfortunately, we will not be offering this feature in the U.S. because a 1980’s law creates some confusion over our ability to let U.S. members automatically share the television shows and movies they watch with their friends on Facebook. The good news, however, is that some forward-thinking members of Congress have introduced legislation, H.R. 2471, that would allow you to make this choice. We’ve got some big supporters in Congress, including Representatives Bob Goodlatte, Howard Coble, Jim Sensenbrenner, Zoe Lofgren, Linda Sanchez, John Conyers, Henry Waxman, Darrell Issa, Judy Chu, Loretta Sanchez, Lee Terry and Sue Myrick but we can use more. If you want the choice to share with your friends, please email congress to urge them to pass this modernizing legislation. Netflix made a similar call in July of this year, but it has added urgency again after the announcement at F8. Let’s be clear: Netflix being unable to offer this feature at launch to American subscribers isn’t unfortunate just because it looks clumsy and might make some impatient customers in the U.S. unhappy. It’s bad because Netflix only has about a million subscribers of all kinds (discs, streaming or both) outside of the U.S. Meanwhile, it has 24 million inside the U.S.
Netflix simply doesn’t have the global numbers to lose or further displease its domestic customers in great numbers. Furthermore, if Netflix is getting any kind of revenue share for Facebook sharing, it’s now only getting 4 percent at best of what it would have. If it anticipated any kind of subscriber bump based on its increased visibility in Facebook, it’s only getting at most 4 percent too. In short, every day Netflix can’t link up with Facebook stateside costs it money and goodwill it can’t afford to lose. Here’s another way this is terrible timing: Hastings’ appearance with Zuckerberg at F8 may actually have been a pretty good time to announce his plans to spin off the digital streaming business from the DVD by mail division, now known as Qwikster. Think about it: Instead of a cheaply made digital video released to the public in the dead of the night, Hastings gets up on stage at an impeccably produced event in front of huge numbers of tech and media press. He praises Zuckerberg’s vision for personal media discovery and social sharing on the web. He talks about how profoundly these partnerships will transform Facebook and digital media. He talks about how profoundly this partnership will transform Netflix, his commitment to the digital future and the courage needed to continue to innovate and move beyond the past, even when you’re leading the market. 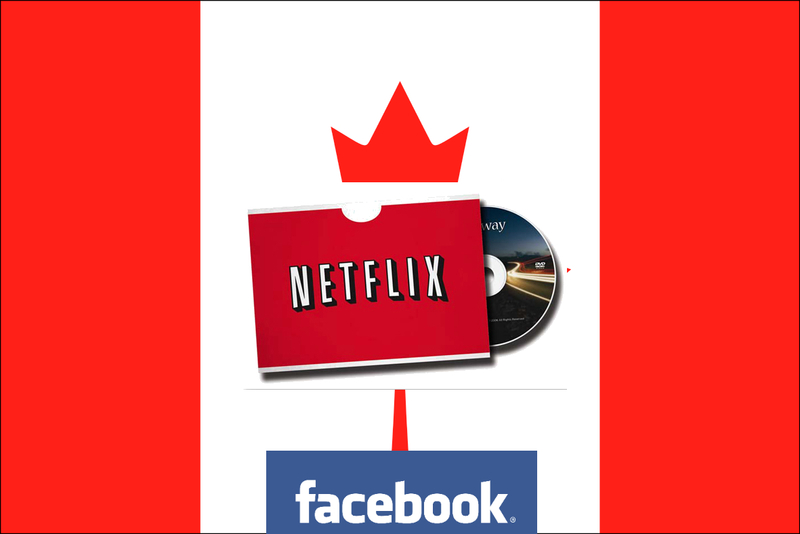 Then he drops the bombshell: Netflix is separating from the disc business to let it pursue its future, and embracing the digital future arm-in-arm with Facebook. His 25 million subscribers with Facebook’s 800 million active users. And he tells them that the new Netflix will eventually be coming to every single one of them, no matter what country they’re in. It would steal the show. Zuckerberg might have to try to talk Hastings out of it just to keep Facebook’s other partners happy. Angry subscribers or analysts raising doubts about leaving the DVD business behind too soon would be drowned out in the torrent of news coming out of Facebook. Hastings and Zuckerberg return to the stage for an encore and execute an admittedly awkward but still impressive version of the Kid n Play dance. Netflix stock goes through the roof. Except Hastings couldn’t do that, because he can’t bring Netflix and Facebook together in the U.S. Because the law won’t allow it. And after some of the problems Facebook has had with privacy, any change to the law is sure to go through serious scrutiny, even with support from key members in Congress. [E]ven if it appeared on the sub-committee’s calendar tomorrow, it would likely take several weeks to get through the legislative process. The bill has been slowly but surely been gaining co-sponsors over the last few weeks. Of the 12 Democratic and Republican co-sponsors, 6 are from California where Netflix is headquartered. While the bi-partisan list of co-sponsors is a good sign, the fact that it has been sitting in committee since July makes one wonder if it will pass or not. Can Washington at least come together on social media integration? At some point in the negotiations with Facebook, Hastings must have known this would be a problem. He ramped up the company’s public government advocacy and lobbying of Congress. The team has been focused on those relationships for months — not customer or media PR. Maybe Hastings thought that if the company worked hard or fast enough, he might be able to throw the tracks down in front before the train needed to ride over them, like Buster Keaton in The General . He didn’t. He couldn’t. Bad luck. Worse timing. Now Netflix needs its subscribers to advocate for the company. But after years of Netflix disrupting itself and shutting down features without having a public plan in place for replacing them, and after many of these subscribers simply feel burned. Netflix has had a checkered history with social features in general and Facebook in particular. Between 2004 and 2010, Netflix had a “Friends” community feature that allowed users to view friends’ queues, suggest movies to each other, and compare ratings of the same movies. By 2010, “Friends” was only used by 2 percent of subscribers. As Netflix made its big push to set-top boxes and game consoles, the company phased out Friends to focus on streaming to televisions rather than port their community features outside the web browser. Beginning almost three years ago, Netflix had a feature that allowed subscribers to share their movie ratings on Facebook. At the beginning of 2011, Netflix turned it off, again citing lack of interest and use. That may have been when Netflix knew it would be pursuing deeper integration with Facebook. If so, Hastings and his team must have thought they had all the time in the world to plan and prepare for the company’s next phase. They were wrong. Meanwhile, Canadians are free to be pleasantly surprised.